The desire to improve your body composition is a very personal experience. Everyone has a different definition of “optimal”, and so rather than hold yourself to someone else’s standard, I encourage really evaluating what your goal means to you. You may be building strength for sport performance, leaning out to achieve your racing weight prior to an endurance event, or simply looking to feel your best. Personally, I’ve found that “feeling my best” changes at different times of the year. I typically run more road and trail races in the spring and fall, and so naturally these tend to be when I am at my leanest. I like to diversify my training programs in the summer and winter, and consider this to be a “building” phase, and I ideally gain more muscle tone during these times. While I track my weight generally month to month, it’s part of a holistic approach to assessing my body composition. I encourage using a variety of measurements like how your clothes fit, circumference measurements (bust/chest/waist/hip), how fluid your body moves and with how much ease, and if you have enough energy and stamina for your pursuits (based on adequate muscle balance). If you really like specific data, consider getting a comprehensive body scan from a health practitioner. I have written about this before, as I used this technology when switching to a predominantly plant-based diet, and I wanted to ensure I maintained muscle mass (I did). The tips below are based off variations to the Thrive Food Pyramid, originally developed by Brendan Brazier and centered around nutrient dense, plant-based foods. If you’re seeking your “racing weight”, improving your strength-to-weight ratio (lean muscle mass in comparison to body fat, for greater athletic efficiency), or simply looking to improve your body composition by leaning out (whether inches, pounds, or your preferred measurements), these tips are for you. Nutrient density is more important for weight loss than calorie deprivation. We ultimately need to consume fewer calories than we expend if we hope to lose weight. It’s easy to consume more nutrients, and fewer calories with nutrient dense plant-based foods, and not feel like we’re constantly going hungry. The Thrive Food Pyramid is built on a foundation of fibrous vegetables, because they have the highest amount of nutrients per calorie compared to any other food group. When you are trying to lean out, you can stretch the base of the Nutrient Dense Pyramid even wider so there is even more emphasis on veggies compared to starches and grains. This not only helps crowd out cravings, but ensures you emphasize carbohydrates from fiber-rich plants (often with higher water content), compared to starchy carbohydrates in the form of grains or root veggies at the top of the pyramid. For example, serving a lentil or tempeh stir-fry on a bed of minced spinach and collard greens, versus rice. Use fruit functionally, and increase proportion of protein and fats in your diet in relation to fruit consumption. Fruit contains valuable phytonutrients and antioxidants we absolutely want to keep consuming in a nutrient dense diet, however when you are leaning out I encourage using a serving of fruit as part of a pre- or post-workout snack, when the (natural) sugar intake will be used functionally. It also helps to reach for lower glycemic fruits (with a lower sugar content), which includes berries, stone fruit, citrus fruits and melons, compared to starchy fruits like bananas and mangos, or dried fruit which is much higher in overall sugar content then their fresh counterparts. Day to day, reach for protein-rich snacks to help maintain muscle, and don’t shy away from healthy fats which support your metabolism through proper hormone production. Check out my recipe tips in this Choose Your Own Adventure Low-Sugar Smoothies post for more ideas. Muscle development comes from a combination of nutrient dense foods, in the right proportions, and at multiple intervals through the day. 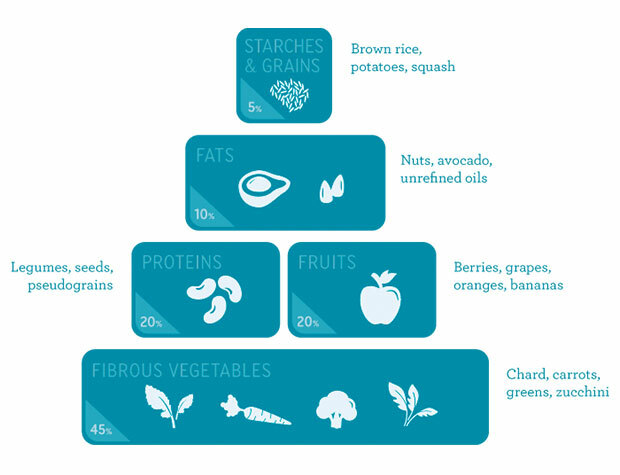 The base of the nutrient dense pyramid can become slightly smaller and more narrow, enhancing the overall emphasis placed on the categories beyond fibrous veggies (such as fruits, proteins, fats, starches and grains). These will by nature be more calorie dense foods, and when we reach for clean, plant-based options, we know the calories won’t be “empty”, but rather functional (like when choosing whole grains versus refined carbohydrates and sugars). As the base of the pyramid narrows, the peak naturally becomes larger in comparison. Know your (protein intake) numbers. Strength athletes can consume upwards of 1.4 to 1.6g of protein per kg of body weight1 (to find your weight in kilograms divide your weight in pounds by 2.2). This intake range needs to be recalculated as you gain body mass, and build your strength. Reach this intake goal by consuming 20 to 40 grams of quality protein with each main meal or snack through the day (will likely indicate a need to eat 5-6 meals/hearty snacks a day). Within your meals, combine foods across each category and let their versatility shine. When choosing nutrient dense, plant-based foods in the form of fats, proteins, or whole grains you’ll probably notice they don’t fit perfectly into one category. Quinoa for example is a good source of complete protein, but it will also contain some starch and fiber. Nuts, like almonds will contain a higher amount of fat, but also can contribute to your protein intake. Combining foods together, rather than just eating one group at a time (i.e. trail mix made just with nuts), can help keep your appetite regulated so you’re not always feeling hungry from higher training volume or maintaining a larger body mass. Stay fueled to avoid muscle catabolism. Muscle breakdown naturally occurs through intense or challenging training (rebuild a stronger muscle post workout through nutrient dense foods). Muscle breakdown can also occur if you go hungry, train too long without re-fueling, or don’t re-fuel properly post workout. Your body starts to breakdown muscle tissue to free up stored amino acids, which the body can use for short-term energy. A whole grain (for example quinoa, rice or barley). These can be pre-cooked to have on hand in your fridge. Prep a new batch weekly. At the end of the day, whether you are looking to lean out, bulk up, or maintain your body composition, #FuelYourBetter with nutrient dense foods as the foundation. 1. Bernardot, Dan. (2012) Advanced Sports Nutrition. Human Kinetics. 2nd ed.